Professor McAleavy and behavioral pediatrics professor Daniel Mruzek believe they have a device that can help parents better potty train children with autism. They have launched an IndieGoGo campaign, hoping to raise $32,000 in order to mass produce their device and send it across the country for more people to use. The eventual plan is to get an entrepreneur to use the device as the basis for a start-up company. Mruzek and McAleavey's device marks the first time UR's technology transfer office — UR Ventures — is using crowdfunding to raise money for early-stage research and product development. One UR Ventures official said the potty training device will determine if the office uses IndieGoGo for other projects. "Crowdfunding won't work for everything, but I could see us doing it again," said David Englert, UR Ventures spokesman. "But it has to be something people understand." The potty training device consists of three parts — a pad with special lining, a sensor and a smart device such as a cell phone or tablet. The cotton slab is basically a pantyliner with material sewn in that detects moisture. It sits on the child's underwear while the sensor rests typically where a belt buckle would lie. When a child starts to tinkle, the liner detects it and the sensor sends a message to a smart device. A parent or teacher's phone would buzz and the caregiver could run to the child and quickly guide them to the bathroom. The theory is, over time, the child will associate a full bladder with going to the restroom, said Mruzek, who specializes in autism spectrum disorders. Mruzek and McAleavey have tested the device since 2012. The results were positive, Mruzek said. Right now, the researchers have to hand-sew the moisture-detecting strips into the pantyliner, a cumbersome and time-consuming process Mruzek said. 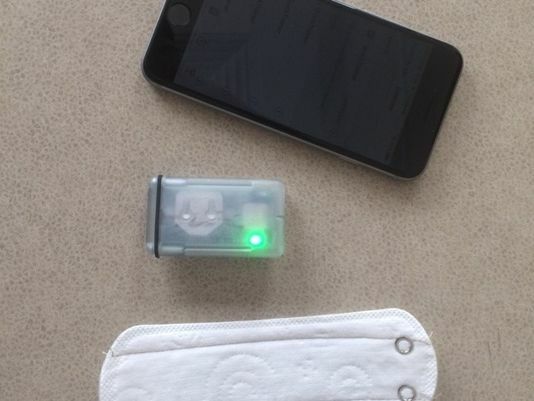 With added money, the researchers would likely hire a local manufacturer that could simplify making the pantyliner-and-sensor connection. The manufacturer would mass produce the piece, allowing the researchers to focus on test results. Read the full article in the Democrat & Chronicle here.